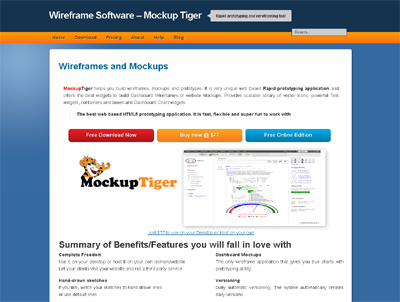 MockupTiger helps you build wireframes, mockups and prototypes. It is very unique web based Rapid prototyping application and offers the best widgets to build Dashboard Wireframes or website Mockups. Provides scalable library of vector Icons, powerful Text widgets, containers and boxes and Dashboard Chart widgets. MockupTiger is the first to provide real charting/graphing library. You can use them to prototype charts and Business intelligence reports and dashboards quickly.